Welcome to the first installment of Is it fast or just cool. 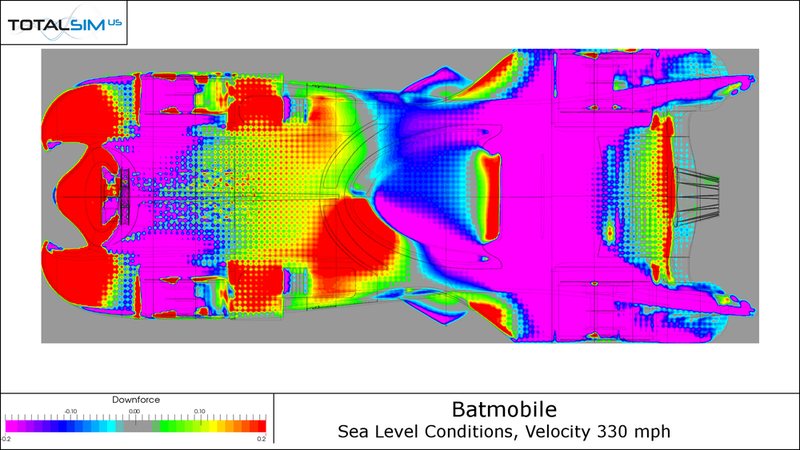 In this series, we will release computational fluid dynamics (CFD) analysis of popular fiction or everyday vehicles. 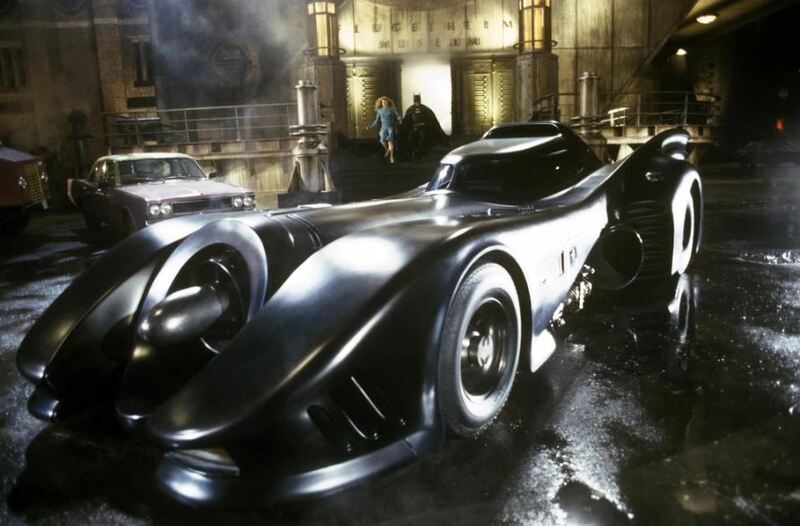 As one of the more iconic Batmobile in the series, the 1989 version was used in two of Tim Burton’s movies: Batman (1989) and Batman Returns (1992). It was designed by Anton Furst and built on a Chevrolet Impala chassis. CFD is a numerical analysis of fluid flow that is used to calculate the interaction of liquids and gas on an object. It started as a tool for aerospace projects to simulate flow conditions or help visualize flow patterns that were difficult to do in a wind tunnel. CFD can be used as a cost-effective aerodynamics analysis tool while providing an alternative to wind-tunnel tests. Today, CFD is heavily used in many engineering disciplines. The simulation was solved using standard sea level conditions with a flow velocity of 330 mph which is the max speed of the Batmobile. Vehicle CAD file  was cleaned and processed via Beta CAE’s ANSA v18.10. Vehicle was meshed and solved on 48 cores. Solve Time (avg Iterations): 0.126 sec. Note: Geometry file was drawn by an enthusiast and the numbers/plots below may not accurately depict the vehicle. The simulation reported Drag Coefficient (CD) value of 0.45. 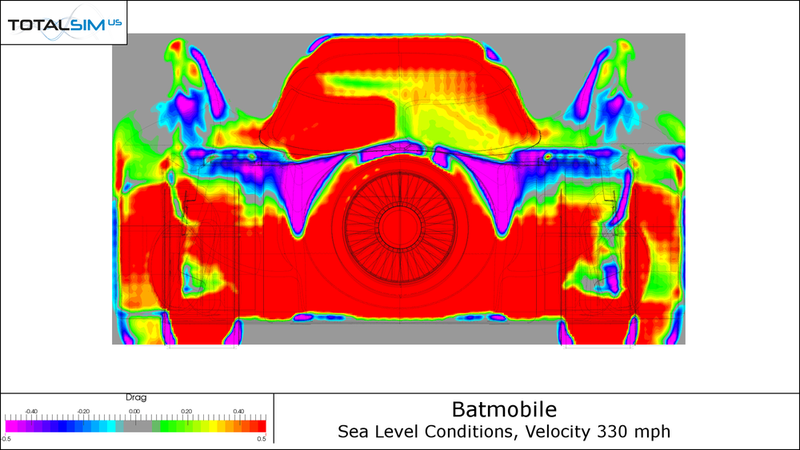 In comparison with the Formula One (F1) racing cars, the Batmobile has a lower CD. F1 cars typically have a CD around 1.0 but could vary due to difference in track setups. F1 cars are not designed for minimal drag, but there is a compromise between drag and the need for downforce. As it is a streetcar, the Batmobile is better compared with other streetcars. Frontal Area is a major factor of drag since the frontal area is perpendicular to the direction of the flow. A Drag XRay plot (shown below) indicates the pressure differential in front and behind the vehicle. 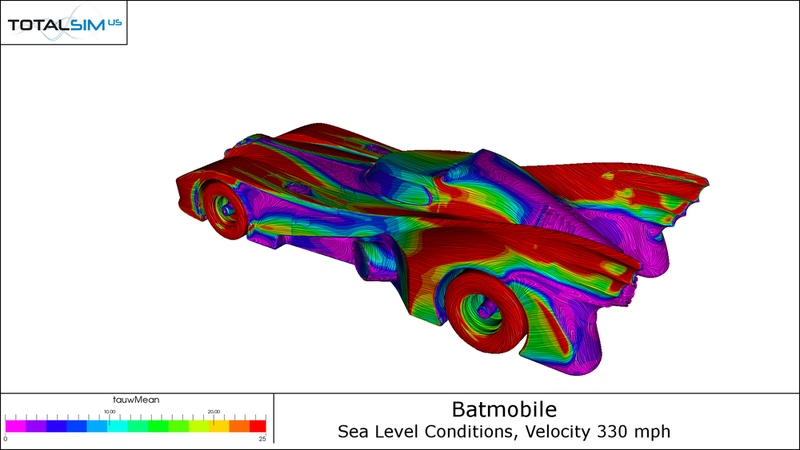 Comparing CDA between the F1 and the Bamobile, F1 cars typically have a CDA around 1.3 while the Batmobile has a CDA just over 1.3. The difference is in frontal area where a F1 car typically has a frontal area of 1.3 m2. In the Pressure Coefficient (Cp) plot above, there is a large region of high pressure at the nose of the vehicle and regions of low pressure behind the cabin and at the wings. The CpX plots sum the pressure forces in the x-direction, therefore, CpX plots are used to look for regions of drag. High levels in the CpX plots show drag while low levels show thrust. In the above plots, the regions in the nose and behind the cabin shows regions of drag. Skin Friction plots shows the surface shear stress of the vehicle. The region in front of the vehicle, the region in front of the wind screen, the windscreen, and rear of the vehicle show low shear stress. This usually indicates that the flow has separated or has thick boundary layer at these regions. Separated areas tend to accumulate drag. From the plot on the left, you can see most of the drag is accumulated in front of the vehicle. The Frontal view of the vehicle is shown on the right and the plot depicts where drag is exerted on the vehicle. As a late 1980s fictional car, the Batmobile’s main purpose was form rather than function. 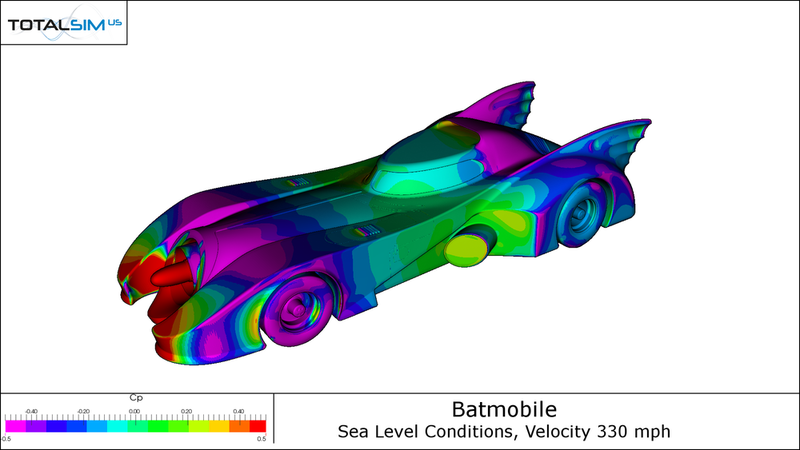 In comparison to some of today’s flashy super-cars, we find that the Batmobile falls short in terms of aerodynamic performance. When run at the asserted max speed, the reported drag coefficient is higher than contemporary and modern day super-cars with it’s Drag-area being almost double those cars. The only car with which it has comparable drag are F1 type cars, but those cars are well known for producing downforce in a well balanced manner. However, as a piece of fiction the Batmobile serves its primary role well delighting audiences with eye candy and going down in the history books as a part of pop culture. Of all the gadgets that Bruce…Batman has at his disposal, this is the one that stand above the rest. TotalSim was founded in 2009 as a full-service computational fluid dynamics (CFD) consulting and solutions group that provides decades of engineering knowledge and insight to clients in the automotive, racing, aerospace and industrial industries. We are headquarted in Dublin, Ohio, with an additional office in Pasadena, California. We also have a sister company in Brackley, England. To put it simply, we use cutting-edge technology to help you solve your most complex engineering problems. With decades of experience in aerodynamics and design, our goal is to assist you in taking your ideas from initial concept to high performance reality. In addition to CFD consulting and custom software, we offer industry-specific applications, training, support and hardware to ensure your product is performance-ready. Accelerates every stage of design and development through automated CFD calculations and workflows. Simplifies complex CFD processes to empower our clients’ success. Empowers clients at every stage with solver-agnostic solutions, support and training. Customizes CFD tools and provides simulation apps tailored to automotive, truck and aerospace designs. 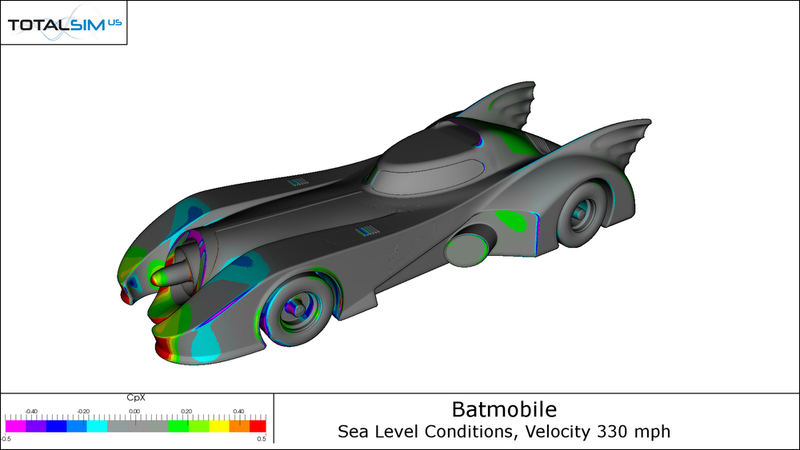 The Batmobile CAD file was downloaded from GrabCAD and drawn by Ahmed Abdelsalam.